Restaurants here are astonishingly tolerant towards children, and will almost always provide colouring pencils or something to keep them busy. There are usually several high chairs. Some also have a 'play corner', which is wonderful for children who won't stay at table. They usually open early enough for an early supper, but do be aware that some very child-friendly places become very much less so in the evening (City Hall, specifically). Coffee and Lunch: The lunch menu is pretty much the same everywhere: a couple of soups, a couple of salads and a whole load of sandwiches! Children's options in cafés at lunch tend to consist of a slice of bread with hagelslag or peanut butter, but if you want something a bit more substantial then tostis (toasties) are usually the best option, although for children who like eggs an uitsmijter (fried eggs with ham/cheese etc served with bread) can be good to share. The only nice place where you can have chips at lunch time that I know of is the Koetshuis. De Koetshuis is good for lunch (opens 12pm) as it's quieter there, but only if your children will sit at the table: city hall is good for wriggly ones as they have a play area but is always very busy. Supper: For supper, children's menus are almost always various things served with chips: fricandel (long sausage of fried mushed meat), kroket (long sausage of mushed meat with breadcrumbs, otherwise served with bread and butter) etc. A lot of places are open all day, and many others open at 5 as people tend to eat early, which is helpful for children. This is not an exhaustive list, rather a list of a few child-friendly favourites! Creatively constructed within the Gementee building City Hall -cafe, restaurant (and for night owls) club - provides a centrally located and child friendly city stop for families. The staff are mostly friendly and welcoming (although service can be very slow) and have a good supply of coloured pencils, paper and some well-worn toys to keep children entertained. The place comes into its own in the summer; both during the day and in the evening the over-sized couches placed in the large square in front of the city hall are comfortable for adults and wonderful for children, who can run around to their hearts content. In the winter, however, it is not really child friendly after about 4.30, as it starts to transform into an adult space and the toys are put away. Do be aware that they don't serve food between 4 and 6 so it's not really an option for an early children's tea. The ladies loos do have a changing table but are rather irritatingly placed up a large flight of stairs, which is a bore during potty training! 4 (amusing animal-shaped) high chairs. 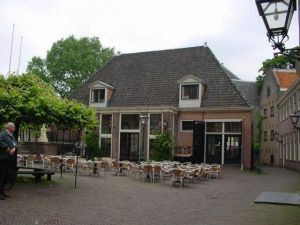 This is an old coach house at the foot of De Burcht castle (and not to be confused with the excellent de Burcht pub opposite), with brick floors and nice welcoming atmosphere. In the winter they have a fire, which you can sit around and drink hot chocolate (one for the older children, however, as it's rather scary with little ones). The restaurant is quiet and peaceful and not usually too crowded: the service is friendly and excellent. It is somewhere to take children who will sit at table, however, as it is not the sort of place that they can run around or play on the floor. 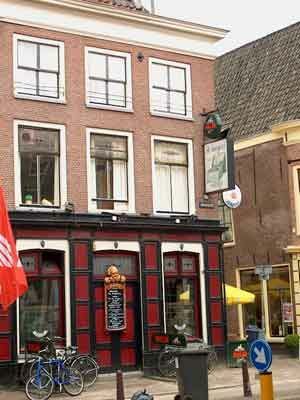 They have excellent soup and some very nice salads: the oriental chicken salad is my favourite Leiden lunch dish! The loos are close but do not have a changing table. Plenty of high chairs. This is open only from 5pm but is an excellent place to go for an early supper: especially if you are very hungry! It's best to go as early as possible as it is a very small space and gets very crowded. It has a lovely (although fairly predictable) children's menu, perhaps most suited for slightly older children, with three imaginatively presented courses. They charge 5 euro for a child/toddler to have a spare plate to share your food. The menu is quite 'man food'- lots of mixed grill type options, and not much in the way of light dishes, but is good fresh food in generous quantities. 2 booster seats. Situated in one of the old gates of the city and looking out over water on two sides, this is a fun place with imaginative modern food (and fairly decent cocktails!) that is surprisingly tolerant of children at lunch and early evening, although not specifically catering to them. In the summer, the outside space is lovely, although not really safe for wandering children. The elegant grey marble loos are not exactly child friendly, and beware of the glass doors (my son didn't see them and ran into one). 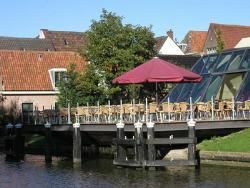 Situated outside Leiden on the, this is a smart new imaginative restaurant . In the summer it is a wonderful setting for lunch with children, as there is a garden and playhouse that keeps them amused for ages. The food available for children at lunchtime is not great, however: a cheese sandwich is ciabatta with very mature cheese, which is not all toddlers' cup of tea. 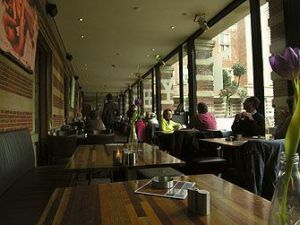 It's a lovely place for an early evening drink and for slightly older children or children who eat later, and they have an exciting and imaginative children's menu for little gourmets. It is not cheap, however! Hidden off the large through road between Leiden and Leiderdorp, this is a lovely place to go with children, especially on fine days as there is really nice little children's farm behind it, with lots of animals that the children can cuddle and space to run around. The restaurant itself is large and 'loungy' - there are fires in the winter and it is often frequented by post-school-run mummies for breakfast. It is a popular place to have parties. In the summer, you can sit outside in the nice courtyard. In the winter they have an open fire with sofas, and as there's also a play table it's very cosy and child friendly inside. This is a tiny, independent deli and café, selling gorgeous organic, homemade pasta etc to take away, and which also has a 'bar' for coffee/paninis/smoothies etc. They use only small-scale producers in Italy, pork from traditional breeds of pigs that roam half wild and only organic wholegrain wheat of a special variety called 'Kamut', which is apparently more nutritious. You can even get 'draught' olive oil. I went there with Evelyn for lunch, and although there weren't any panini (because, bless, the bread wasn't quite ready yet), they had some fresh pizza which we both adored (and they also gave her a bowl of cherry tomatoes, which made her very happy). She also got a cup of hot milk with froth in her own 'grown up' cup, which went down very well. It was such a pleasure to eat somewhere with such a personal, welcoming feel, and where they really went out of the way to be kind and thoughtful to a foodie 4-year old. Plus it was € 5 for both of us, so excellent all round. This new baked-potato, healthy speedy food restaurant/takeaway opened recently. The two young men who have set it up are lovely, enthusiastic people who contacted me for tips on how to make it more child-friendly and accessible for the international community. It's a lovely space, and their food is YUMMY! They focus on baked potatoes with various fillings, but also do baked apples and a few other things such as homemade compotes and chutneys. The food is mostly organic and locally sourced, and they make a real effort to do things responsibly and sustainably. They are still in the early stages, but will soon (hopefully) have highchairs, a children's corner, organic smoothies and juices, and original toys for the children to play with (Mr Potato Head was my idea!). They both speak excellent English. They are happy to do half portions for children, and there's lots of room for pushchairs, especially at lunchtime. Moreover, they are really open to ideas, so if you have any comments or ideas for how they could improve, let them (or me if you are shy) know! It's a good place to go if you are really hungry, as one of their potatoes, for about € 6, will keep you going all day.